In March I got a new pump, since my older Minimed Paradigm 522 was very out of warranty. The differences between the 522 and the 523 are slight and barely noteworthy, but I would miss them if they went away. The “No Delivery” alarms were mostly my fault. (Running a reservoir to completely empty will lead to that . . . along with the possibility of high BGs, so I don’t recommend it. I’m trying to pay more attention to how long it’s been since the previous “Low Reservoir” notice.) Those four “Motor Error (43)” messages, however, are definitely a problem with the pump and always appeared in the middle of a bolus. 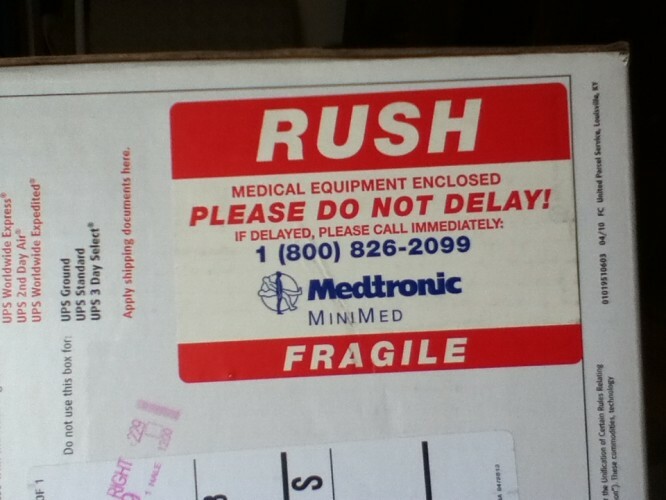 Minimed’s customer service is great, and they delivered a new pump to me next day. The “next day” happened to be a Saturday, and the UPS man arrived mid-morning shortly after I got back from the track, where I had run ridiculously fast 30-second repeats—like 4:20/mile fast—in my last speed workout during the taper before this weekend’s 70.3. (Sorry, I’m getting distracted.) Sadly, technology will fail, but I’m glad that the manufacturers realize that these devices keep us living and go to extraordinary lengths to make things right. Tomorrow, after transferring all of my settings into 523 #2, I’m sending 523 #1 back to the mothership. Godspeed little pump. May your refurbished motor be error-free in the future. This entry was posted in Data-betes, Diabetes. Bookmark the permalink. It has to be something with the 523. I pumped MM for eight years and never had a motor error. All the people who have had motor errors recently (Gina, Scott J, Scott E, Wil D, etc) have all had them with the 523. One of the changes they made was more precise dosing abilities (an additional decimal level in basal?). I wonder if it is just too sensitive now? Just when Medtronic came out with their alert on the ‘proper way’ to fill a reservoir, I figured I had been doing it wrong all along and that the pump is fine. Then I see this post. Sara’s right — either the additional precision means it’s got a keener “eye” towards errors, or there is seriously something wrong with the pump (the fact that I’ve never heard of the equivalent error on a competitor’s pump makes me wonder – do they even check for it?). I’m not so sure what to think. A part of me wonders if the delays in releasing the American version of the Veo pump (Revel with LGS) has to do with the FDA looking closely into the reported motor errors. Purely speculation on my part, but it’s a possibility. Not sure if anyone is on this website anymore. It’s 2018 and my pump (523) died now I’m searching high and low for a replacement. Is anyone is out there in Internet land? If u have any old pumps laying around. I desperately need one. I can pay, not a lot or I would buy a new pump lol. Im hoping for a miracle. I do have some items to trade. Or maybe there’s something you know that I don’t kniw. Ive been able to fix this pump for years. Im stumped this time. Motor error. It won’t bolus. It just keeps shutting off.